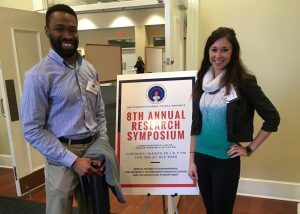 (Left) Ovuokerie Addoh and (right) Emily Frith bring home first and second place awards in the 8th Annual Graduate Student Council Research Symposium. The symposium acts as a mini-conference, allowing graduate students to discuss their research through podium and poster presentations in the categories of social sciences, education, business, accounting, physical and life sciences, arts, humanities, journalism, mathematics, computer science and engineering. For more information on Applied Sciences graduate programs, visit the School of Applied Sciences online a www.sas.olemiss.edu.